Of course, it works for many other states, too! 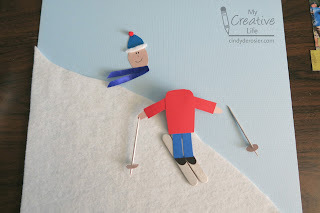 A lot of my crafts, including this one, start as sketches on a scrap of paper. 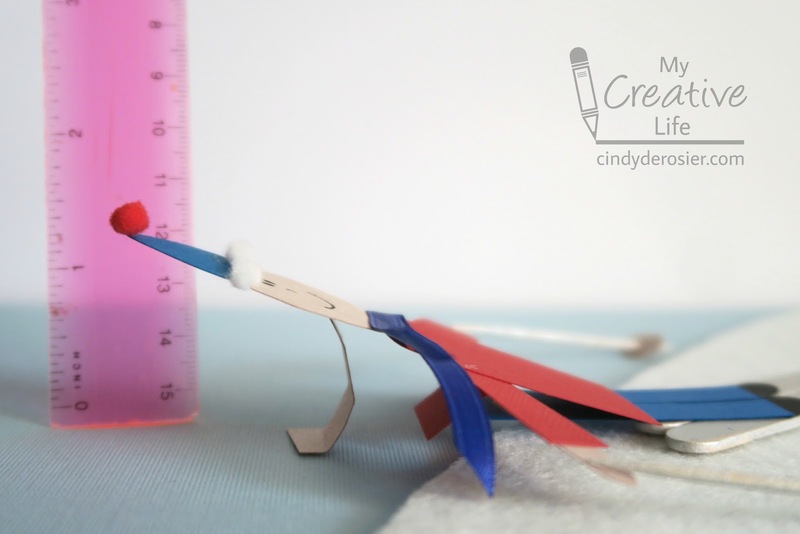 There's a bit of trial and error involved in turning a sketch into a physical craft. But that's half the fun for me! Paint two craft sticks and two toothpicks silver. Set them aside to dry. Cut the felt along the diagonal to create a snowy slope. Make it as steep as you want! Glue the felt to the light blue background. Cut a sliver of white felt to use as trim along the edge of the hat. Cut all the body parts and clothes: an oval face and two oval hands from the skin tone paper; a rectangle with a slim bit cut out (pants) and triangle (hat); a curved rectangle (jacket) and two rectangles (sleeves). Save the scraps. Assemble the hat: glue the felt sliver to the bottom of the triangle and add a mini pom pom on top. Cut two boots: ovals the same width as the craft sticks. Glue them in place. Glue the pants on top of the boots. 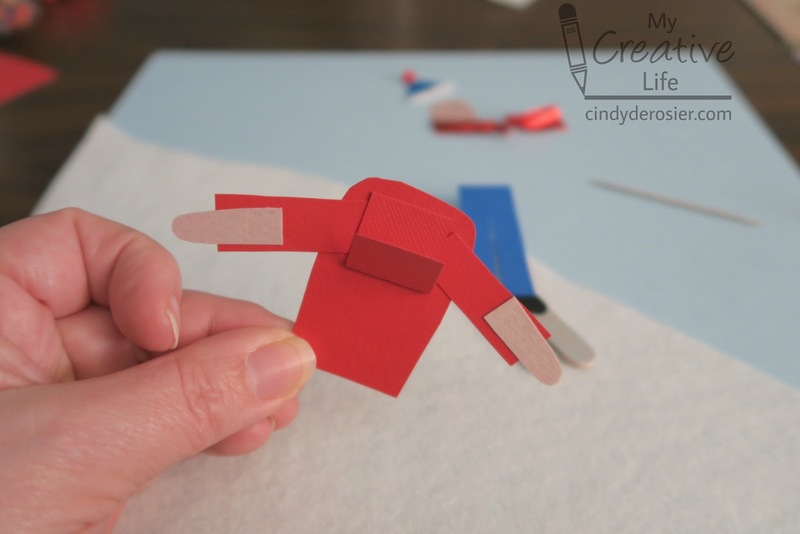 Assemble the torso by connecting the hands, sleeves, and jacket. 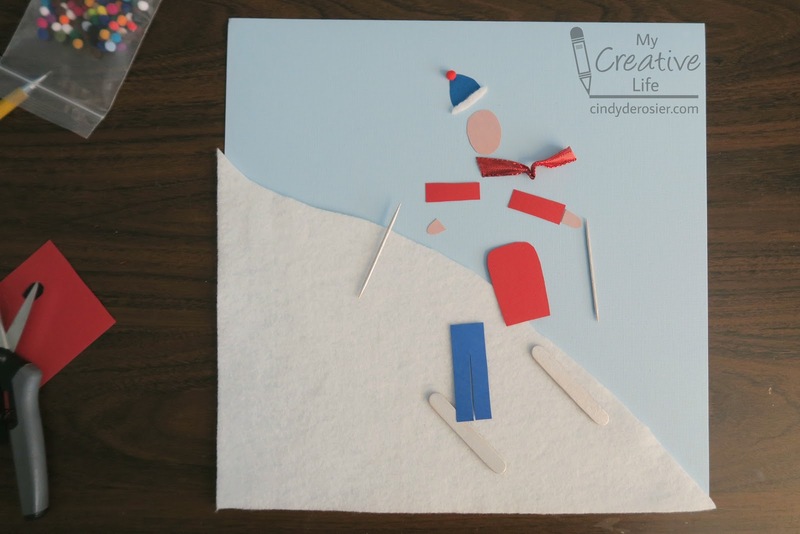 Add a folded scrap to the back. Glue the torso to the legs. 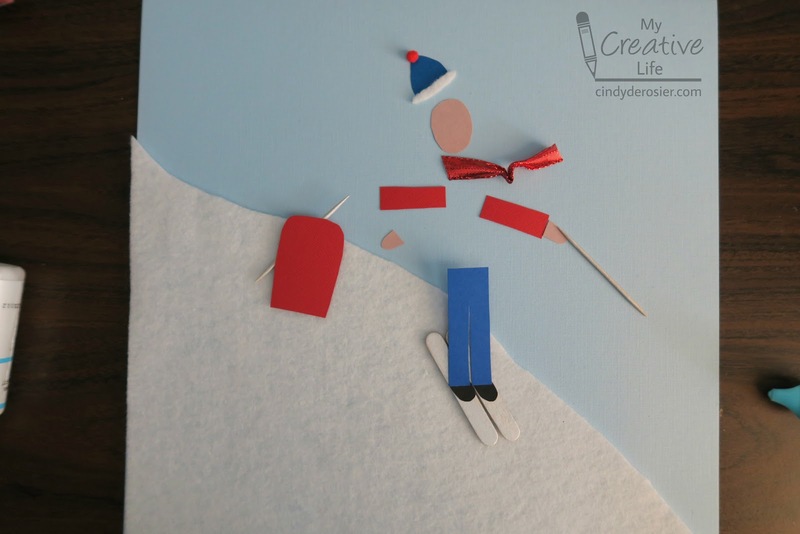 Pick the whole thing up and put glue on the jacket flap and the craft sticks. Glue it in place on the background. 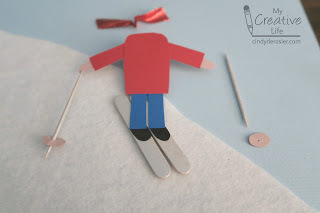 Cut two small circles of grey or silver construction paper and poke the toothpicks through them to make ski poles. Add a skin tone flap to the back of the head. It should be longer than the flap on the back of the jacket. 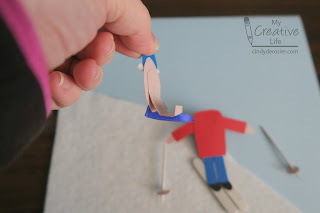 Add glue to the flap and the head. Glue the head to the jacket. Here's what it looks like from the side. 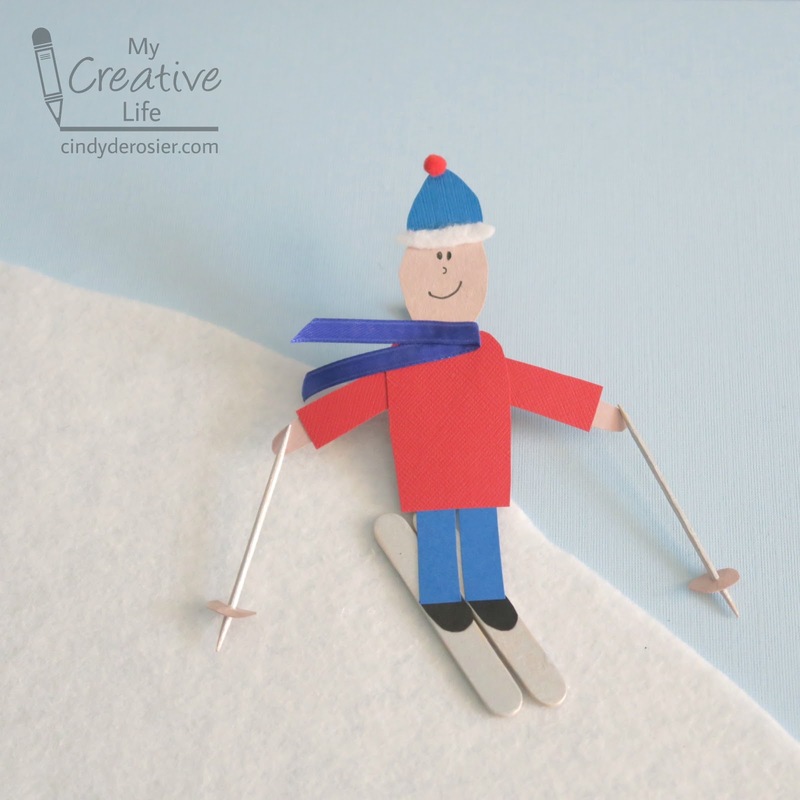 Glue the ski poles to the hands. Fun fact: I've been to Colorado for weeklong visits four times, but have never been skiing there. 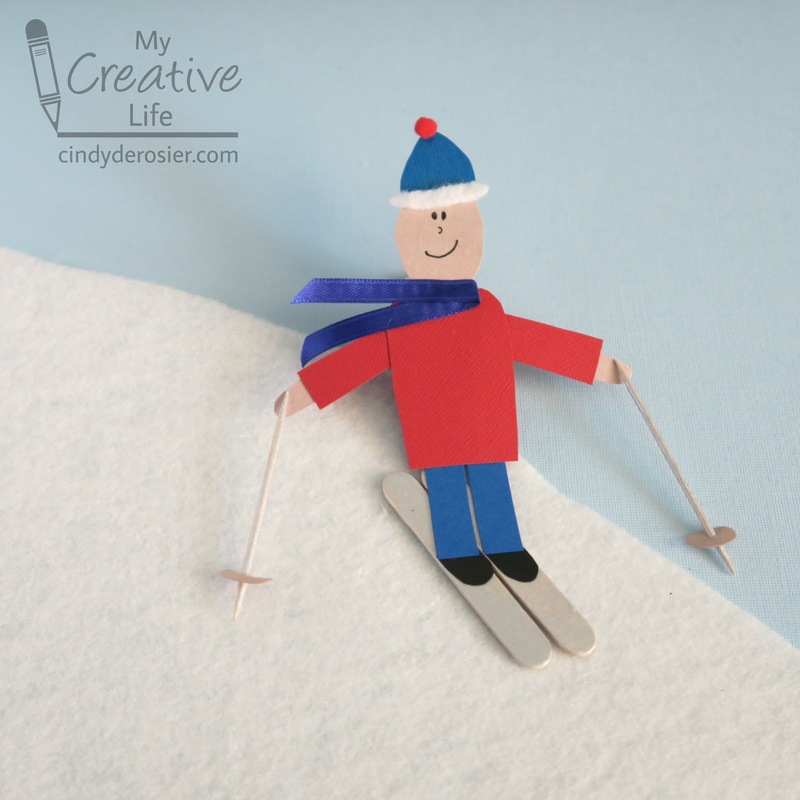 (I have skied in California, Nevada, and Washington.) Yet skiing is the first thing that comes to mind when I think of Colorado! Three weeks ago, I published my prediction for craft trends in 2018. 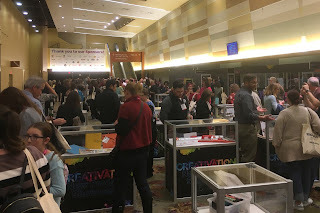 Let's look at the biggest trends from the Creativation show and see how I did! 2017 was all about cacti, hot air balloons, flamingoes, pineapple, coloring and dreamcatchers. I can say with confidence that 2018 is undoubtedly the Year of the Llama. (Or alpaca. I can't really tell them apart. I'm going with llama.) This is just a small sampling. There were llama papers, stickers, dies, stamps, and project kits. It's a good time to like llamas. I called it! Narwhals, everywhere. You can see one in the 'Mermaid Tales' photo above, too. Apparently mermaids are friendly with narwhals, because they often appeared together. It should be no surprise to anyone that everything having to do with Dia de los Muertos is huge. Butterflies in flight have been popular for years, but 2018 brings us butterflies used as repeating patterns. In most cases, these butterflies are flat like specimens. While I love butterflies, I prefer them to look alive and in flight. Yep. Apparently teapots go well with unicorns, which seems a little weird to me, but whatever. Echo Park has an Alice in Wonderland line with plenty of teapots, butterflies, and the vintage flowers I'd also named as a trend. No surprise. Hand lettering, or the look of hand lettering, is everywhere. I saw quite a few dies to cut letters that look as though they're done by hand. Cameras, bicycles, triangles, script, watercolors, and tropical leaves were all well-represented, as I'd predicted. I didn't see as many pennants, glasses, or plaid patterns as I'd expected, but they were definitely there. As for colors, I did not see Ultra Violet at all. No surprise, for a variety of reasons. Nor did the pink & grey, peach, and navy colors that I saw in so many sneak peeks dominate at the show. They were there, but not enough that I'd call them a theme. I saw the word 'obsessed' on two different items. Definitely not enough to call that a trend. Now more photos, just for fun. First up, a paper with Unikitty, plaid, a llama, glasses, vintage flowers, a bicycle and a flat butterfly (with a bonus ostrich). Unicorn, camera, script, and hand lettering. Bicycle, tropical leaf, glasses, camera, and last year's flamingo and pineapple, both still going very strong. Mermaid, camel (quite a few of those as well), seahorse (another friend of the mermaid), pineapple, llama, palm tree, unicorn, flamingo, mason jar, swan. 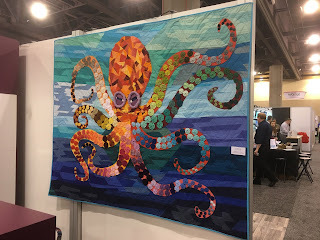 There were a lot of octopi too. So there you have it! Any trends you're loving? Anything you'll avoid? 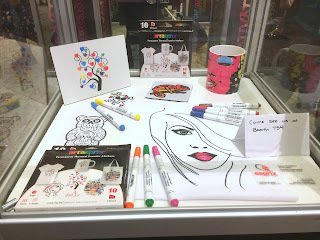 Usually I do a separate post about the neat products and/or the things on my wishlist following Creativation. This year, I put them on a Pinterest board. Check it out! 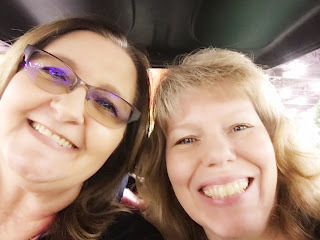 I'm back from Creativation, unpacked, and caught up with the most essential things in life that happened (or didn't) while I was traveling, so it's time to tell you all about my trip! ... and made it to my first class 8 minutes before it started. Whew! I had two classes, both very informative. I dropped the supplies for my class off at the workshop office, then headed to my hotel (with significantly lighter luggage) to check in. I had a few minutes to unpack before I went to a craft blogger meet-up for dinner, Cricut crafts, socializing, and connecting. Big thanks to Angie and Carolina for organizing it! My day started bright and early. Or should I say, dark and early? I was up at 5:00, too excited to sleep. My first class of the day was Urban Sketching by Lee Kellogg. 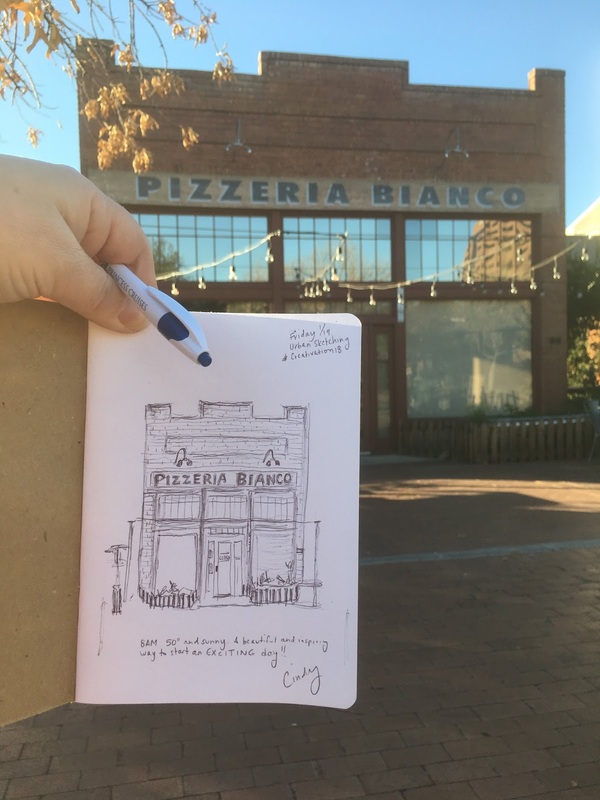 It was a beautiful morning for sketching and put me in the perfect mood. The only thing that would have made it better was if the pizzeria was open. The cooks were prepping and it smelled amazing! 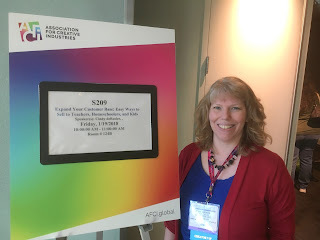 Next was the first of two highlights of my Creativation 2018 experience: teaching my first seminar at an AFCI event. I had over 70 retailers come to learn about marketing to kids, teachers, and homeschool parents. It was so much fun! I really do love to teach. I will absolutely be applying as a speaker at all future Creativation shows. I had a series of meetings and classes nonstop from 11:00, when my class ended, until 5:00. I joined many of the other attendees at the New Product Showcase. 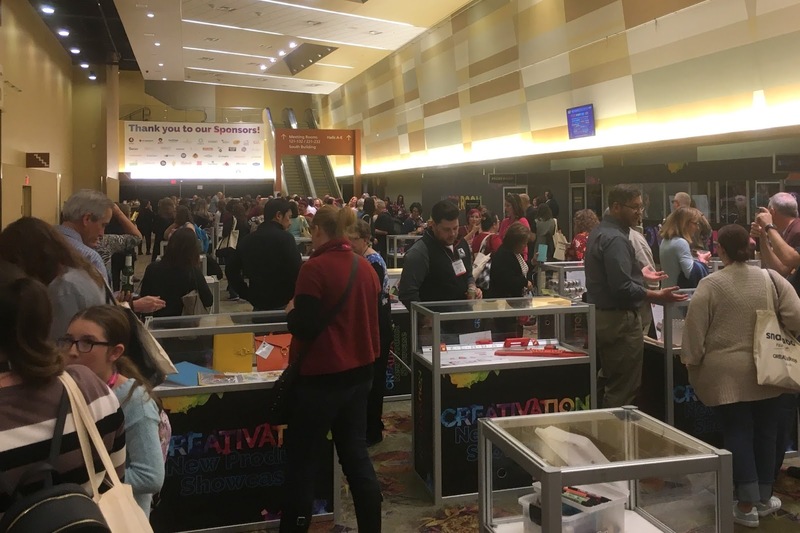 A large area of the lobby was filled with glass cases that highlighted some of the most exciting new products that we'd see the following day on the show floor. It was loud and crowded (two of my least favorite things), so I zipped through there pretty quickly, only stopping to photograph the most intriguing products. I met my friend Julie and her husband for dinner, which was awesome. I haven't seen her in person since we first met in 2011! But it seemed like as soon as we sat down, I had to run off to my next appointment. As one of the many door prizes for my class, I'd donated an hour of one-on-one consulting to a lucky winner. This ended up being the fabulous Stacie of LS Scrapbook Boutique and This and That Framing, who was joined by her equally fabulous husband Randy. We had a great talk and I'm hoping to visit their store when our family travels eventually take us to Missouri! I set an alarm clock, concerned that otherwise I wouldn't be up in time for the 7:45 event, but I needn't have worried. I was up at 4:00, too excited to sleep. I'm a morning person, so it was actually very helpful to have a few hours in the morning to answer emails and finalize plans for the day. And since I wasn't sharing a room this time, my late nights and early mornings didn't disturb anyone. The early bird catches the worm, or in this case, the early blogger sees a gorgeous sunrise over the Basilica. 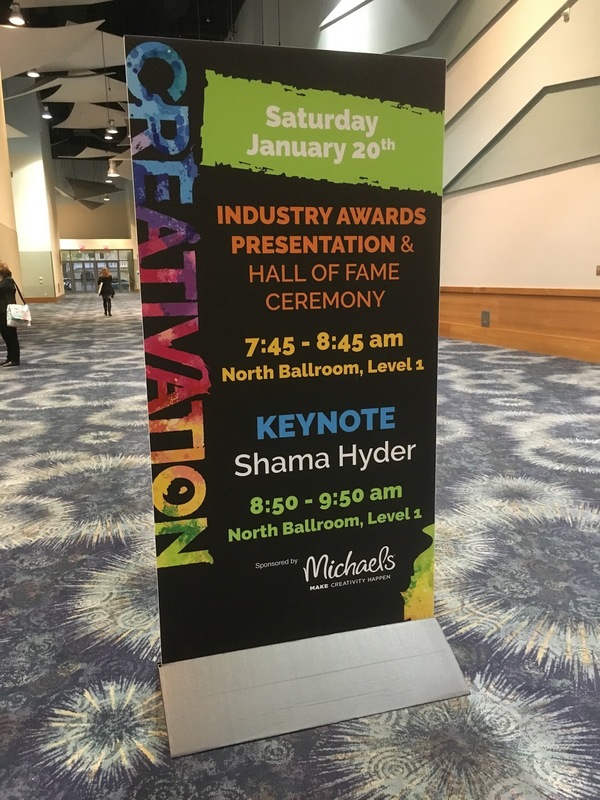 I attended the Industry Awards Presentation and Hall of Fame Ceremony, but left before the keynote started. Why? 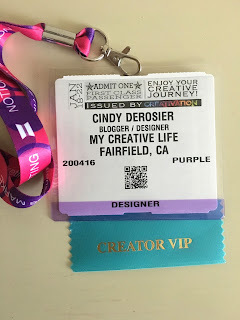 Because the Creator VIP group was invited onto the show floor for breakfast and a private tour! Amanda and I sat together for our tram tour around the not-yet-open room. It was so exciting to get a first look at everything! ... and soaked up the beauty of an entire convention center's worth of craft supplies. Heaven! I did some make-and-takes, joined Amanda for my first-ever Facebook Live, caught up with companies I've worked with in the past, and kept my eye out for trends. And then, something amazing happened to me that afternoon that changed everything. I can't talk about it yet (soon, I hope!) but the news was so huge I had to call Steve immediately. He has always been my biggest supporter and I'm so grateful. Next, I watched the AFCI podcast, recording from the show floor. The show floor closed, and I hustled over to a nearby hotel for the Prime Networking Event. I've made some great connections at this event over the years. Basically, each of the sponsors has a table where they can connect with bloggers. The food is plentiful and the drinks keep flowing. Polyform, the makers of Sculpey, were new at the event this year. I love me some Sculpey! Once again, I was up long before even the early bird. I couldn't manage to sleep more than about 4 hours a night, but adrenaline kept me going strong all five days! 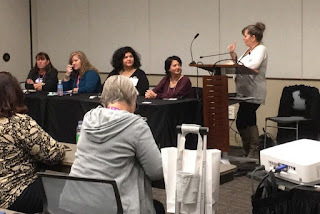 Sunday morning's session about the Children's Craft Category was extremely interesting and beneficial. 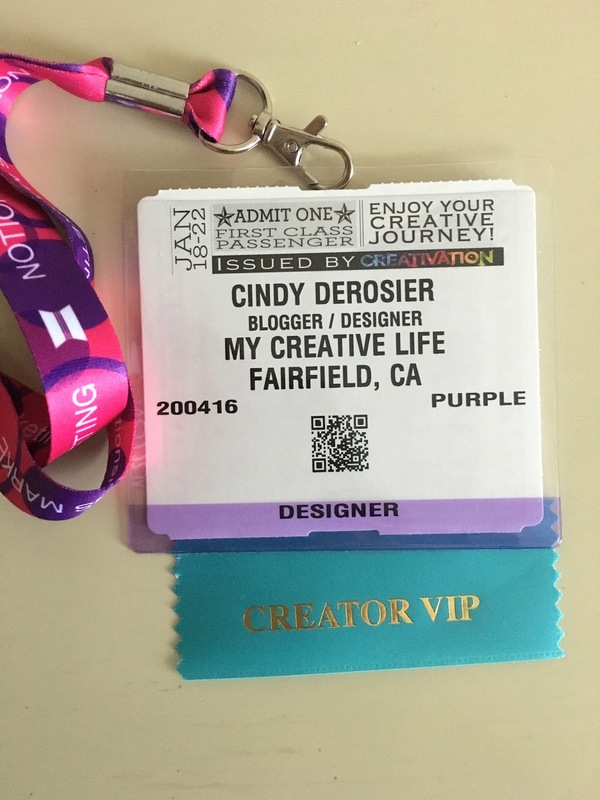 I spent my time on the show floor doing many of the same things as the day before: taking photos of trends, meeting up with brands I love, watching demonstrations, and doing make-and-takes. One of my favorites was painting with Unicorn SPiT. I also did nine Facebook Live videos on Sunday, including booth tours, demos, and interviews. You can see those here. When the show floor closed, I joined friends at the After Party, held at The Duce. It was a lot of fun and the food was delicious, but remember what I said about crowds and noise? Not my favorites. I left a bit early, which was just as well, as I needed to figure out how to pack all the samples, projects, and literature into my luggage before checking out in the morning. I checked out of the hotel and schlepped my luggage to the bag check area, only to realize they didn't open until 9:00. That was a bummer, since I was there at 7:30 for the Annual Business Meeting and Town Hall. Yet another event where I had to wrangle two suitcases. At 9:00, I got my bag checked and headed onto the show floor for the final day. I had a brief meeting, then went to the stage to watch The Ultimate Pitch competition. Big congratulations to Little Pink Ladybug on their win! From there, I went to the Kit Xchange booth to work a 3-hour shift. (You may remember the product review I did for them.) Staffing a booth was another first for me. 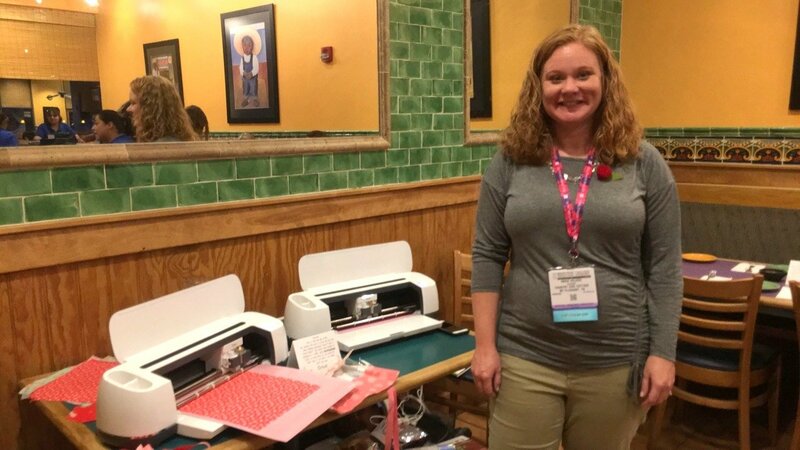 I really enjoyed showing off the fabulous product. That was key. If I didn't love the products, or if the people I was talking with didn't love the products, it would have been a long three hours. But that wasn't the case at all. Everyone loves the Kit Xchange products; in fact, I have my eye on a few to add to my collection! All too soon, the show floor closed. I got my luggage... and realized I would have to completely repack to fit the day's goodies inside. Sigh. I ended up using a zippered duffel bag as an extra suitcase. I should have had someone take a picture of me schlepping my huge rolling suitcase with a duffel bag strapped to it with one hand and my rolling backpack with the other. I'm sure I was quite a sight. At least I wasn't running this time! I enjoyed the leisurely trip to the airport, found a spot, and waited patiently for my flight. Ah, but it was not to be. More plane delays. In fact, I was quite surprised to receive an updated flight time of 24 hrs. 50 min. 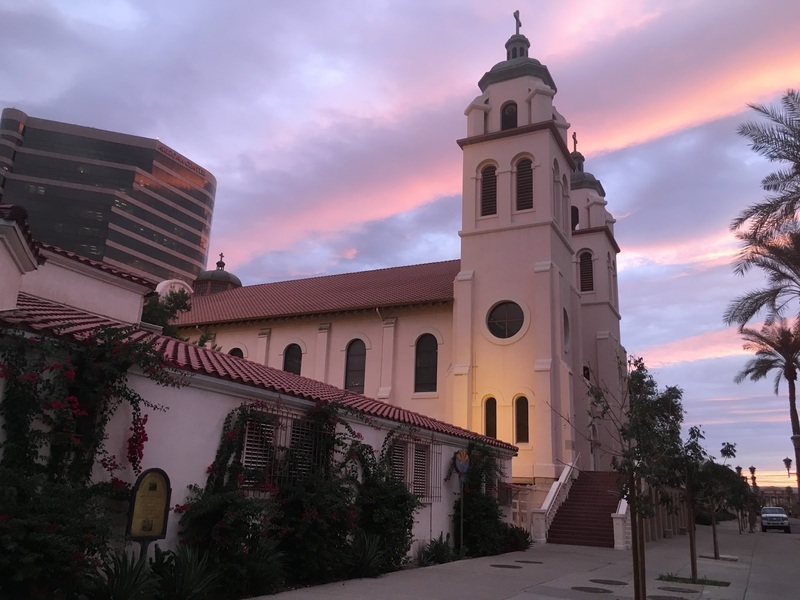 to fly from Phoenix to Sacramento! And a gate change. And another delay. When I finally got home, it was just minutes from being Tuesday (but the flight was only 2 hours, not 24+). It wasn't until the next day that I discovered that my bags had been searched and apparently my paint samples were inspected (opened). Sigh. Nothing important was damaged, thankfully. Overall, I had a wonderful time at Creativation. Tomorrow I'll share all the trends I saw, and see how I did with my predictions.